Last week I told you about a suggestion to have a Gondola System in place to move passengers from Ogden Point to the Inner Harbour of Victoria. As in all things new for Victoria , the local James Bay Community met with the developers to say NO. 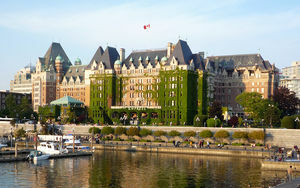 At this point they have elected to consider another option and the Harbour Authority meanwhile came back with a proposal for 2014 that will allow passengers to either take double decker buses (High Volume) or a boat shuttle ( tender) into the Inner Harbour itself where you can dock almost across from the Fairmont (Empress) Hotel. On another note , cruise ships with berthing, passengers, crew and dry-dock repairs, upgrades brought in about 200 million dollars over the last two years including around 680 jobs per statistics of the GVHA (Greater Victoria Harbour Authority) published this weekend. This week it was announced that a company in responding to ways to shuttle cruise passengers to the Victoria downtown including wheelchair passengers has proposed a Gondola system, much like used for skiing or across rivers. The intent is to move passengers from Ogden Point to downtown Victoria in about five minutes following a route over two streets just above tree top level in a covered unit ( 8 passengers). Cost might be around $10 Cdn return which is on par with current shuttle costs. This is in response to the Greater Victoria Harbour Authority for ways to reduce traffic, noise, pollution during the cruise season and to give passengers and crew more options of travelling back and forth to the city centre.